Despite their massive linearity, Directly Heated Tubes (DHTs) have one major disadvantage. Their filament is part of the signal flow, i.e. is included in the audio path, hence the heater supply is affecting the sound. TentLabs now introduces a novel module, based on traditional techniques, but with some major advantages over existing solutions. Read further!
" What I hear, compared with my earlier applied DC heating, is increased articulation, an improved focus and clearance between instruments and soloists. The soundstage increased in depth. The original supply has a softer tone, you could call it dull – do I want that back? No way, not at all. And I was surprised by the result, especially compared with the small amount of work to be done... "
" Part of this smoothness is attributable to the Tent Labs heater supply, comparing the standard supply to the Tent Labs one shows a higher degree of smoothness "
" Hum levels are vanishingly low, with my 100db loudspeakers I can just hear a trace hum up to around 8cm from the main driver "
" I installed the Tentlabs filament supply on my DIY lady day 300B monos and I must tell you it is a very worth while and cost effective modification. The tonal quality of my amps has improved as well as lowering the noise floor to almost undetectable amounts "
" Just wanted to drop a note to say I installed my supplies this weekend. I originally switched to DC supplies last year because of hum. However, I have not been happy with the sound since. That is until installing the Tent supplies. Installation was a breeze and the sound, from the moment I switched the units on was much better. Gone was the for the lack of a better word, "dullness". Back came the detail and crispness that I had before going DC "
" A few weeks ago I asked about using the Tentlabs filament power supply for my field coil speakers. Well, I tried them and I have to say that they are best power supply I've used with these speakers "
Existing current supplies lack true high output impedance and need adjustment during use. This new module is truly different in many areas - read on ! The current source maintains the high output impedance (typically > 10kOhm), whereas the voltage control takes away the need to trim the output voltage after installation, or during use. The accurate reference guarantees long term stability, and contributes to a clean output current. The module exactly supplies that amount of heater current, until the required DC voltage is achieved, e.g. 5V for a 300b. The rectifying bridge consists of low noise Schottky Barier diodes and Electrolytic capacitors (a total of about 20.000uF for the 2.5A version and 34.000uF for the 5A) with a well chosen amount of ESR, to dampen and reduce the current peaks - all contributes to low noise output ! In addition, the chosen diode bridge, smoothing capacitors and power control contribute to an efficient module: Only 5.8Vac is needed to supply a filament module feeding a 300b. Each tube needs its own filament supply, in turn fed by a separate winding from the power transformer. The whole supply then is floating, and only has one connection to ground, as shown above. This example above shows the DHT in fixed bias mode. When using cathode bias, the grounded leg has to be connected to the top of the cathode resistor instead. These are the only connections to the filament, so no caps, no hum-bucking pot, no nada! The total output current is limited, depending on the version, but they all start-up slowly. Especially when the tube is cold, this is a nice feature. Cold tubes, when heated with traditional supplies, draw currents up to ten times their nominal current. Using TentLabs heater supply will gently switch on your tubes. The units are factory adjusted at your order. After installation, the supply needs minor DC adjustment, to compensate for possible voltage losses in the wiring (some 100 mV are easily lost at high currents). During use, no adjustments are needed anymore, not even after changing the tubes ! The new generation filament supplies has an over temperature indicator and shutdown, in case the heatsink-temperatue exceeds 90C. The LED and wiring is supplied separately with the modules. • Output Voltage adjustable between 1.5V and 9V, specify when ordering. • Output current: automatically adapts to required level to reach voltage specified above. 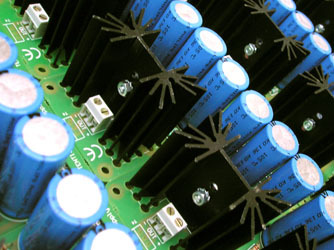 • Input voltage should not exceed 1 V above specification (see application info). • Output noise < 20 uVrms (1 Hz - 20 kHz). • Output hum < 200 uVpeak at 100Hz / 120Hz. • Output impedance 10 mOhm at 0Hz. • Output impedance 10kOhm > 5Hz. • Low noise version, output currents up to 1A. These typically serve small size triodes to be used as line stages. Output noise is 26dB lower compared to the standard version. Often used in conjunction with type 26 tube, integrated heatsink. Output current can be increased to 2A upon special order, at the penalty of 6dB noise. Still 20dB more quiet than the normal filament supply. • Standard version, output currents up to 2.5A. These typically serve small and medium size triodes up to output tubes like 300b and 2A3, and have an integrated heatsink. • Output currents up to 5A. These will suit the beefy types like 211, 813, 845 and SV572 and have a bigger heatsink. • Total size 50*90*40mm (W*L*H, heatsink included, standoffs excluded). • Hole pitch 41* 81mm. • Needs 10mm stand-offs to mount on chassis, supplied with modules. • Total size 50*100*90mm (W*L*H, heatsink included). • Weight 375 gram (each, excluding packaging). • Needs M4 bolts to mount on chassis, not supplied with modules. If you don't find a suitable supply in terms of currents / voltages, please apply. 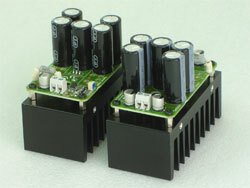 For example for the GM70 we can supply a derived version from the 5A supply, generating 20V. 5 years of warrantee is valid for the filament supplies, assumed they are build in according application information.